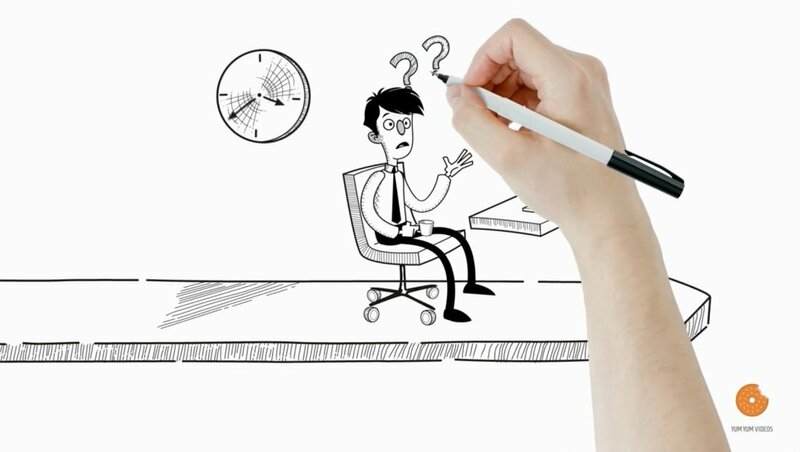 How can hand-drawn animated videos benefit your marketing strategy? Here at Yum Yum Videos, we’ve seen first-hand that this style of video is one of the most used in online marketing – they’re highly useful to connect with a target audience, because of their engaging nature and their great synthesis power. Marketers love them! Because these videos give them the chance to explain a complex business idea in just a few seconds, in a highly educational way. But what makes these videos unique is their style – they have a very recognizable animation style which makes it highly attractive to an audience. Classically, it’s made out of a whiteboard background (or another kind of background that could serve to draw on, like a piece of paper), a continuous drawing and a hand that draws. Because of their popularity, you’ve probably seen them before! Let’s take a look at the basics of this video style. Originally, these videos were drawn in real life, by an artist that was being recorded with a camera. As the years went by (and the technology improved), the technique was improved and empowered with 2D animation. Also, some special effects were added, to give the style a boost (which also helped achieve a high-quality result!). Of course, the classic style of animation translated into lots of time and effort, and also, in most cases, a very poor result. On top of that, if the artist made even the tiniest mistake, it couldn’t be solved and they had to film it all over again! Gladly, nowadays the process is much more time and cost-effective, because by now it’s all made digitally. This makes the style more polished and clean, and it’s also faster to produce… and any mistake can be solved instantly without having to start over. Digital hand-drawn videos also introduced animated characters and situations to this style, which was something that couldn’t be done before! Not every scene gets animated, but strategically, you can animate some parts of it to make it more engaging to the viewer and to highlight certain parts of the message. But this is only the beginning! Let’s take a look at the steps needed in order to make one of these videos for your brand! How to make a hand-drawn video step by step! In order to create one of these videos, the first step is to write a script. This will be the backbone of the video, and the starting point for the rest of the steps! 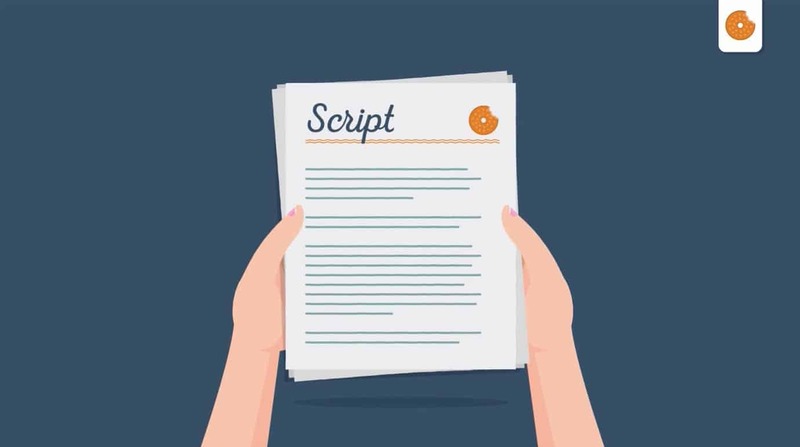 An animated video script must follow a clear narrative structure. Because these are usually short videos (90 seconds or less), the best choice is to stick to a classic structure of a beginning, a middle and an end. It’s the kind of structure you’ll find in a lot of Hollywood flicks! In this case, the structure of the script must answer some basic questions. At the beginning of the story, your script should answer “What?” – What is the problem that your target audience is facing? In the middle of the script, answer “How?” – How will your product or service help your target audience, and how will it solve their problems? This solution must be explained as simply and as directly as possible. At the end, you must answer “Why?” – Why should your audience choose your solution, instead of the competition’s? It’s very possible that there are other companies and brands that offer similar products, that could also solve your audience’s problems. So, why should they choose you? What’s the main characteristic that makes your product or service the best? After your script is done, we recommend that you always read it out loud, so you want to make sure that it sounds natural – reading a script out loud helps you make sure that the words you’ve chosen are the best ones to communicate your message; and also that the voice inflection, speed and emphasis on certain words sound as natural as possible. After your script is done, it’s time for the storyboard! In this step, you’ll be organizing all of the visual actions of the video (or, at least, the main ones! ), and you’ll describe how the story will be developed during the video. The storyboard is one of the most important steps of the video production process, because it will be the reference for the work of illustrators and animators, voice over actors, and everyone else involved. Basically, a storyboard will show the different scenes of the video, with sketches or visual cues. Underneath each scene, you’ll need to write some descriptions of what will be happening in the video; and the part of the script that’s meant for each scene. Here’s an example! In whiteboard animated videos, drawings are always connected, so it shouldn’t have any clipping or camera swaps between shots – and this is something that must be stated in the storyboard. The script is done, the storyboard is ready and approved by the creative director… so, the next step is to animate it! There are many different types of animation styles, but for hand-drawn videos, the important thing to remember is to keep the drawings connected. If your animator is not familiar with the style, it can be very tricky – so keep in mind that you should find a team that has experience with these types of videos, so you can make sure that everything runs smoothly. Most of the time, the best way to go is to find a professional animation studio, (or a video production company) that’s experienced in whiteboard and hand-drawn videos. You can know if a team is right for you if you take a look at their portfolio and feel like their animation style will work for your brand! After the animation is done, it’s time to record the voice over. Recording a voice over can be very tricky, but it’s not impossible if you have the right person doing it! The right voice artist is someone that can provoke a positive emotion and a strong emotional connection with your target audience. So, make sure that you choose a voice actor that has the versatility to play with different tones and inflections, in order to provoke the desired effect. A positive connection with your target audience is not only about voice inflection though. Your voice actor needs to speak the target language natively, in order to inspire identification in your viewers. After the voice over is recorded, it’s time for the final touches! Color correction, music and the right sound effects will give it a nice and professional finish. Here are some of our favorite hand-drawn animated videos. Take a look at how all of these elements come to life! Whiteboard animation is a one-way road. Because of its high synthesis power, and the way that it translates complex concepts into fun and entertaining videos meant for specific audiences, it’s one of the most used video styles in online marketing! It’s also easier than it looks. The only thing you need is a highly-skilled team with proven experience with this style. So, if you’re interested in including a video like this in your marketing strategy, don’t hesitate – the benefits it will bring to your brand’s communication are endless. Once you go hand-drawn animated, you’ll never go back!